Eis is much more than just a summertime treat. As far as I’m concerned, it’s a way of life ’round these parts. (A way of life I fully subscribe to.) 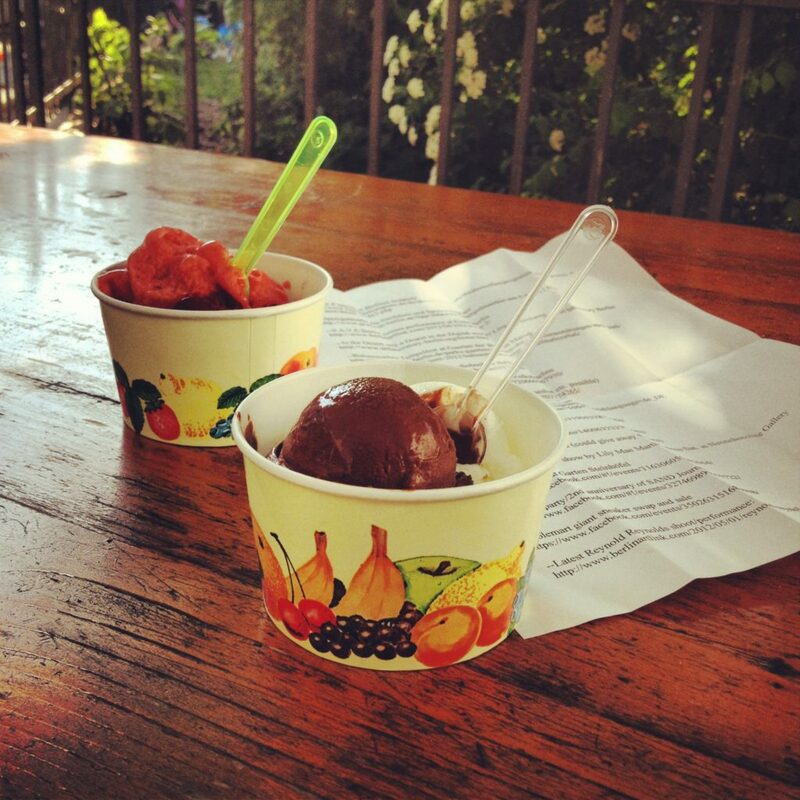 Yes, no doubt that ice cream is delicious, but that isn’t the only reason why I, and so many other Berliners, go nuts for it every summer. After all, there are plenty of delicious foods in this world. As a child, my favourite food in the world was mashed potatoes. Even now, my grown-up self can still sometimes see the face of God in a perfect buttery pile of mushy spuds. However, neither I nor anyone else will ever clamor for mashed potatoes, line up around the block for mashed potatoes, or base an entire day around an outing to go eat some mashed potatoes. Because potatoes are always there. They’re the sensible footwear of the culinary kingdom. Solid, dependable, practical–dull. Eismanufaktur helps a work “meeting” go down easy. Ice cream, on the other hand, is a little coquette. In Berlin, anyway. Here, the vast majority of ice cream shops open only in the spring, around April, and close again in the fall. And thus the start of Eis season represents redemption and salvation after Berlin’s long, miserable, insufferable grey winters. The knowledge that, like summer, it will be over before you know it–long before you’re ready–imbues it with a sense of urgency. 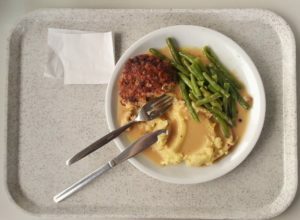 It’s not unlike the asparagus fervour that grips Germans every spring. Those little spiky beacons of spring come and go so fast. Anyway, on to the goods. Last year, I took it upon myself to review seven of the most hyped ice cream shops across the city in a two-part series (click to read parts one and two) for sugarhigh. Tough job, but someone had to do it. Since then, however, I’ve come to revise my opinions somewhat. Namely, that the Eismanufaktur is no longer at the top of my list. I still think they’re good, but they’ve toppled from their pedestal. The flavours seem to lack the potency they once had. And very single scoop I’ve had so far this season has had gritty ice crystals in it. Die Eismacher’s ube flavour is very, very purple. Pandan on the left. I still love Die Eismacher, a lesser-known place near Südstern in Kreuzberg. (Though they’ve raised their prices from €0.90 to €1, but that’s inflation for you, I guess.) Their range of flavours is far more exotic than the average Eisdiele–must-try types include pandan, a tropical leaf with a cocoa bean-like aroma, and the deep purple ube, both of which are traditional flavours in the Philippines. 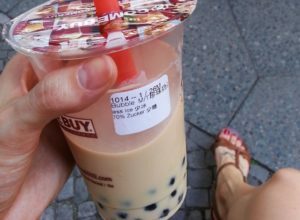 This week, I tried “1001 Nachtschichten” (a cute reference to the Arabian “1001 Nights” stories) which was more exciting by description (black rice, rosewater, and fig) than in taste. The guava-hibiscus sorbet did not disappoint, though–authentic in flavour and not overly sweet. The other amendment I would make to my sugarhigh reviews: Graefekiez’s Anna Durkes deserves a higher ranking. For some reason they didn’t overly impress me last year, but this year I’ve been going well out of my way to come here. (Which is more often than I’d care to admit.) And not just because the owner is such a doll. When I ordered the pistachio recently, he positively beamed with delight and said, “I’m very proud of that one!” And indeed, the pistachio is something special–a natural brown instead of the usual bright green, and tasting intensely like the nut and nothing else. The Anna Durkes flavour range is more reminiscent of an Italian gelato parlour than the same old Berlin stuff. There are multiple varieties on chocolate, for example, from dark and smokey to sweet and milky, tiramisu, zuppa inglese, ricotta with caramelized fig… and I once had a mint-chocolate that I still dream about. They never seem quite as busy as the other places in the Kiez (the never-ending construction out front, and annoying scaffolding, may have something to do with it). And while I wish them enough success to stay in business, I must admit it’s nice to be able to order Eis without having to wade through a sea of squawking rugrats. Here’s to a long and delicious ice cream season ahead. Wow, pandan and ube sound terrific! Speaking of exotic flavors, have you swung by the South America-influenced Inka Eis yet? I would love to treat you to a scoop of their lúcuma. So pleased your blog is up and running! 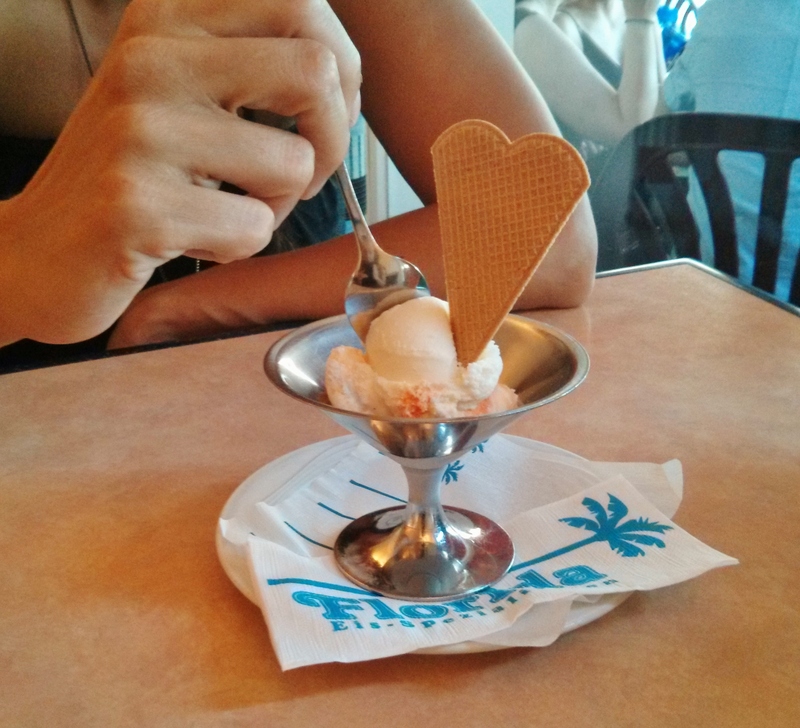 I think all Germans go crazy for Eis. My wife grew up in a small village near the Dutch border (pop. 2000) and she tell me that every year the Italian family that owned the Eis shop came back (like swallows) to reopen their store. As a kid who grew up in the Philippines, I consumed ube ice cream like no other (why take the half gallon when you could go for the whole thing?). I am so glad that there is a piece of home in Berlin. Glad you can find a taste of home here! 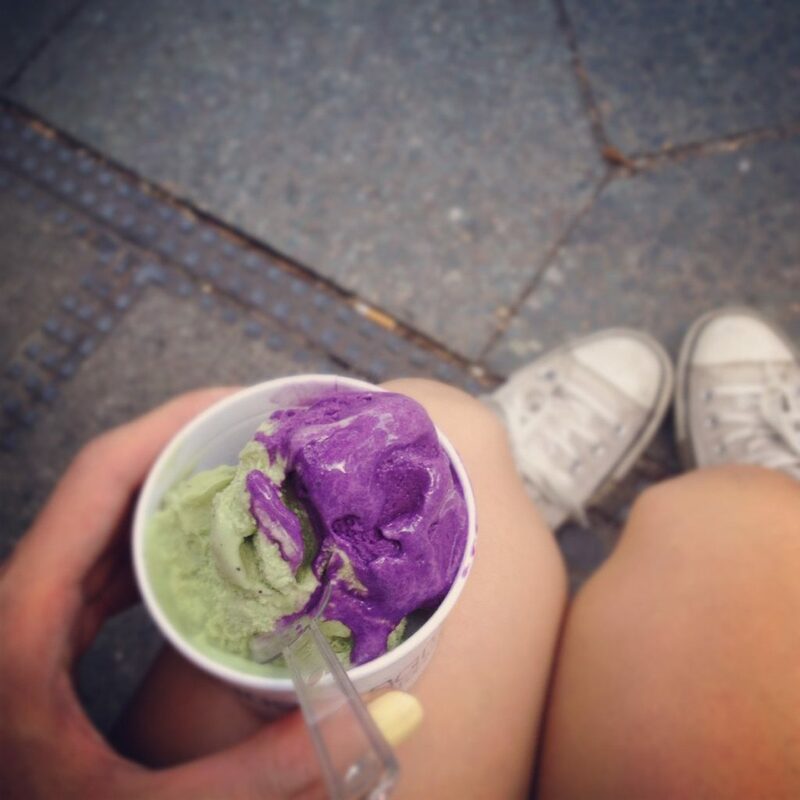 I must admit my first-ever taste of ube ice cream was at Die Eismacher. I grew up in Taiwan, though, where we had our own purple ice cream flavour: taro. Nowhere near as delicious as ube. Let me know if you stumble upon black liquorice flavour. I tried it while I was in Sweden sometime ago and I have never forgot it!! !